This paper studies the effect of medical marijuana legalization on the number of marijuana users in a given state's general population. To measure the number of marijuana users in each state, I used survey data that covers multiple years. Given this data, I used a differences-in-differences model to see if the changes in marijuana use over time in legalized states are signi ficantly different from those in non-legalized states. While my initial results showed that legalization significantly increases the percentage of marijuana users in the general population, this was no longer the case when I specified the medical marijuana states that allow for home cultivation and those that do not. When I added home cultivation to the regression, the home cultivation dimension of medical marijuana laws was shown to significantly increase the number of past month users. These results suggest that the marijuana demanders in the general population are not deterred by legal penalties, but that the reduction of supply side penalties via home cultivation increases the number of past month users. The main question that this paper seeks to answer is: "How does the legalization of medical marijuana affect the number of marijuana users in a given state?" Marijuana users were measured in two ways: first time users, and past month users. The former has implications for medical marijuana legalization's in uence on introducing people to marijuana, while the latter has implications for medical marijuana legalization's in uence on those who have tried it to use it on a regular (monthly) basis. Meanwhile, medical marijuana legalization, in its purest sense, is defined in this paper as the legality of qualifying patients and their caregivers to consume marijuana. Most medical marijuana states require patients to be 18 to qualify, and in states that do not, minors rarely qualify for medical cards (Pacula, 2007). To answer this question, I compared marijuana use over time in medical marijuana states with marijuana use over time in non-medical marijuana states. Using a differences-indi fferences analysis, I attempted to estimate the policy effect of medical marijuana legalization. To do this, I examined the changes in marijuana use in states that legalized medical marijuana with the changes in marijuana use in states that did not legalize marijuana, over the same time period. Furthermore, I attempted to isolate medical marijuana legalization in its simplest form by distinguishing between medical marijuana states that allowed patients to cultivate marijuana plants at home and those that did not in my final regressions. Data for first time use and past month use came from the annual National Survey on Drug Use and Health, while the data on medical marijuana legalization and its components came from previous studies on the policy. The results of my model including home cultivation indicate that medical marijuana legalization does not have a signi ficant effect on the number of first time users or past month users. These new results contribute to the literature on marijuana use because there has been little work studying the rates of marijuana initiation within the general population; most studies focus on non-first time use among the youth. Another contribution includes estimating the effect of both medical marijuana legalization and home cultivation laws on different age groups. The marijuana regime literature is important for estimating the effects of marijuana policy liberalization on marijuana consumption. According to supporters of drug prohibition, increased marijuana consumption would have mostly negative implications. They argue that consuming illegal drugs like marijuana is irrational because consumers tend to underestimate the drugs' addictiveness, and that the drugs have negative health consequences (Miron and Zwiebel, 1995). They also state that a negative externality of consuming illegal drugs is that it causes users to commit crimes. Supporters of drug policy liberalization argue that the negative externalities of consumption are small compared to those of prohibition such as resources expended on enforcement, and violent crime caused by an illegal drug trade (Miron and Zwiebel, 1995). Thus, supporters of drug policy liberalization assert that without regard to its high negative externalities, marijuana prohibition can only be justified if it reduces use that produces negative externalities or is individually irrational. As medical marijuana legalization has taken place more over time, study on the policy has grown within the marijuana regime literature. Not only is medical marijuana legalization an insightful topic because it affords even more legal protection for patients than decriminalization can, but also because it grants legitimacy to some suppliers (dispensaries). For most of recent history, almost nothing has been known about supply side policies. However, Anderson and Rees (2014) were able to study the effect of dispensaries on teen marijuana use by using a differences-in-differences model comparing teen marijuana use across years and counties. They used Los Angeles County, which had hundreds of dispensaries open in the 2000's, as a treatment group, counties with no dispensaries in the same period as the control group, and local Youth Risk Behavior Survey data to measure teen marijuana use. Their results revealed that dispensaries did not have a significant effect on teen marijuana use, since adults still faced high risks of selling marijuana to minors1. In a previous study, Anderson and Rees (2013) compared trends in hospital admissions to non-federal hospitals in Colorado (recorded by the Drug Abuse Warning Network) before and after Colorado's mass opening of dispensaries to study the effect of dispensaries on marijuana use. Their results showed once again that dispensaries have no effect on levels of marijuana use2. While dispensary proliferations allow for groundbreaking study of reduced supply side penalties, the majority of medical marijuana legalization literature has focused on the demand side penalties. 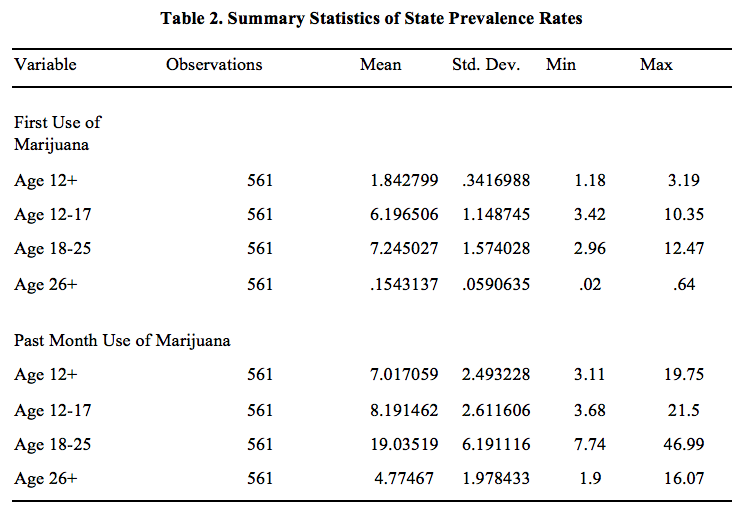 Harper, Strumpf and Kaufman (2012) used a differences-in-differences model to estimate the effect of medical marijuana legalization on state prevalence for past month use and perceived risk of monthly use. Over the period 20022009, they found no significant impact of legalization on either past month use or perceived risk for any age group3. This is the only study I came across that looked at the survey data for the general population, as the rest of the studies either focused on adolescents or followed a cohort through time. One such study by Anderson, Hansen and Rees (2013), used state and national Youth Risk Behavior Survey data to construct a linear probability model, finding that legalization has no significant effect on teen marijuana use4. As the medical marijuana literature has developed, researchers have increasingly treated medical marijuana as a heterogeneous policy. Pacula, Powell, Heaton and Sevigny (2013) looked to isolate the different dimensions of medical marijuana laws, such as requiring "pain" for a card, allowing home cultivation, and allowing for dispensaries. Using three different datasets, the National Longitudinal Survey, Youth Risk Behavior Survey, and the Treatment Episode Data Set to measure marijuana use, they ran regressions on different dimensions of the medical marijuana law. Their differences-in-differences results suggested that home cultivation had a positive effect on heavy youth use and that dispensaries led to more hospital admissions5. However, Anderson and Rees (2013) criticized this study's inclusion of a dispensary dummy, noting that there are often many years in between the law allowing for the dispensary and when dispensaries actually begin to open6. Given the aws of a dichotomous dispensary variable, and the results in Anderson and Rees (2014) and Anderson and Rees (2013) that suggest dispensaries have no significant effect on marijuana use, I wanted to study the home cultivation dimension of medical marijuana legalization. Pacula, Kilmer, Grossman and Chaloupka (2007) present the theory that any reduction of legal penalties for suppliers, particularly home cultivation, will reduce price and increase marijuana use. The first argument is that it is impractical to stop home cultivators from being illegal sellers, while the second is that home cultivation creates "social availability"7. This "social availability" argument states that minors would come into contact with marijuana growers more often under home cultivation and have increased opportunities to try marijuana8. There was no specific variable for home cultivation, which motivated my inclusion of a home cultivation variable in my model. I believed my model would contribute a new aspect to the literature and also synthesize several distinct aspects of different studies that have not all been brought together in a single study. I had yet to encounter a measure of first time use in the literature I had only come across survey data for use in the past year or past month, or measures of the intensity of marijuana use among past users. I obtained my measure from the NSDUH, which has the advantage over the NLSY or YRBS of surveying a representative population. This allowed me to account for legalization's effect on the general population, but also potentially examine preferences across age groups, and diversion from adults to minors. While one aforementioned study used the NSDUH for estimating the effect of medical marijuana legalization, I was able to add the past three years of observations (in which several states legalized medical marijuana). And unlike this study, I attempted to isolate home cultivation and as a result, medical marijuana legalization in its most basic sense. My main hypothesis was that medical marijuana legalization would not increase the number of first time users or past month users because legal penalties do not deter consumers of marijuana. Enforcement against consumers is impractical because as established by the literature, marijuana transactions mainly occur in the privacy of one's residence9. Considering the difficulty for law enforcement to accurately guess when marijuana transactions are occurring within a home, law enforcement needs to violate civil liberties in order to curb these kinds of transactions. And unlike for dealers of harder drugs, who commit large amounts of violent crime and reap much bigger profits, law enforcement has little support for invading the homes of potential marijuana dealers. Given a near non-existent risk of consuming marijuana, I maintained that marijuana legalization does not make it significantly easier for demanders of marijuana to consume it for the first time or on a regular basis. While those 18 or older can obtain a medical card with relative ease by claiming ailments that are difficult to verify, I predicted that the number of first time and past month users in this age group would remain stable. This is because the legal protection afforded by medical marijuana legalization would only significantly benefit those who already consume marijuana frequently. If that were the case, intensity of marijuana use among already frequent users might increase, but not necessarily the number of people who want to use marijuana for the first time or on a monthly basis. For the latter types, such modest use makes the expected risk of consumption quite small and the fixed cost of purchasing a medical card unjustifiable. Since marijuana use is more common among 12-17 year olds and 18-25 year olds (see Table 2), it may be argued that 26+ year olds lack the underground networks to consume marijuana in the absence of a medical legalization. While this may be the case, 26+ year olds who have not tried marijuana for the first time would not want to at their current age. As I claimed earlier, transactions in the black market occur with little risk to the dealer or consumer. Thus, I predicted that those who are 26+ and have not tried marijuana at their current age decided not to do so because they simply derive little to no utility from it. I expected this to remain the case in ages 26+ because marijuana use becomes less attractive as career and family obligations become more time consuming and as leisure time decreases. To turn my question into a testable hypothesis, I compared medical marijuana states and non-medical marijuana states across time in a difference-in-differences model. In essence, the model compares the changes in a variable over time for a treatment group and the changes in the same variable over the same time for a control group to see if there is a significant difference. If the difference is significant and shifts in group characteristics have been controlled for, the treatment is said to have a significant effect on the chosen variable. For my study, I compared changes in marijuana use before and after legalization in legalization states with changes in marijuana use in non-legalization states over the same time period. Controlling for changes in state characteristics, any significant difference would have been caused by the passing of a medical marijuana law. Knowing this, I expressed the model in terms of a regression. In my regression, my dependent variable was whichever measure of marijuana use I was testing ~n first time use or past month use. To indicate whether a state was a treatment state, I used a dummy variable that would equal 1 if the state would eventually have legalized medical marijuana. This variable accounts for inherent differences between legalization states and non-legalization states that might affect marijuana use (such as liberal attitudes towards marijuana use). The variable that estimates the effect of legalization (thus our variable of interest) is a dummy variable that equals 1 in legalization states in years after the legalization has taken place. If this policy effect variable was significant at the 5% level, then I would reject my hypothesis that medical marijuana legalization does affect marijuana use. Otherwise I would fail to reject my hypothesis. Finally, I added a dummy variable for every year in the time period I studied minus one, to control for any time-related trends in marijuana use. To control for differences across states, I added variables for policies that were not specifically medical marijuana legalization, and added some controls for time-variant state characteristics. First I added decriminalization variables because decriminalization may increase marijuana use via reduced penalties on the demand side. I also added each state's unemployment rate and median household income. The former may increase marijuana use by allowing for more leisure time, while the latter may increase use if marijuana is a normal good. Lastly, I added each state's tax on a pack of cigarettes since cigarettes and marijuana may be substitutes, in which case increased cigarette taxes could increase marijuana use. where Firstuse is the percentage within a state that reported using marijuana for the first time in the last year. Mml equals 1 if the state has ever passed a medical marijuana law up until now and 0 otherwise. Post, the variable of interest, equals 1 if Mml equals 1 within that state, in a year after medical marijuana has been legalized in that state. Decrim equals 1 if the state has ever passed a marijuana decriminalization up to this date, and 0 otherwise. Postdecrim equals 1 if decrim equals 1 for the state and the observation takes place in a year after the state has decriminalized marijuana. The variables year2003-year2012 are dummies indicating the year to which the observation belongs to. Unemployment is the state's unemployment rate, Medincome is the state's median household income, and Cigtax is the state's tax on a pack of cigarettes. I ran this regression on three age cohorts (12-17, 18-25, and 26+). Lastly, I ran the same regression with Monthuse in place of Firstuse (for the general population as well as the 12-17, 18-25, and 26+ cohorts). In my final regressions, however, I added a variable for home cultivation. 16 out of the 21 states allow patients and caregivers to grow a certain number of marijuana plants at home (see Table 1). Since home cultivation laws have all happened concurrently with legalization, I added a dummy variable, posthc, which equals 1 in years in a home cultivation state in a year after the home cultivation law passed and run additional regressions. The purpose of making my regression more specific was to isolate the effect of a medical marijuana law in its basic form, which is a law that grants patients and caregivers legal protection to consume marijuana. The dataset that I used to measure marijuana use was the National Survey on Drug Use and Health (NSDUH), which fit my differences-in-differences model in that it allowed for plenty of variation in time and space. The NSDUH, which is an annual survey sponsored by the Substance Abuse and Mental Health Services Administration (SAMHSA), provides information on the use of illicit drugs, alcohol, and tobacco in the non-institutionalized population of the United States aged 12 or older, with a sample of approximately 67,500 (Harper, 2012). The fact that it is annual fit my model because I was able to examine years before and after medical marijuana legalizations. The data covered the period 2002-2012, or 11 consecutive years of marijuana use outcomes. 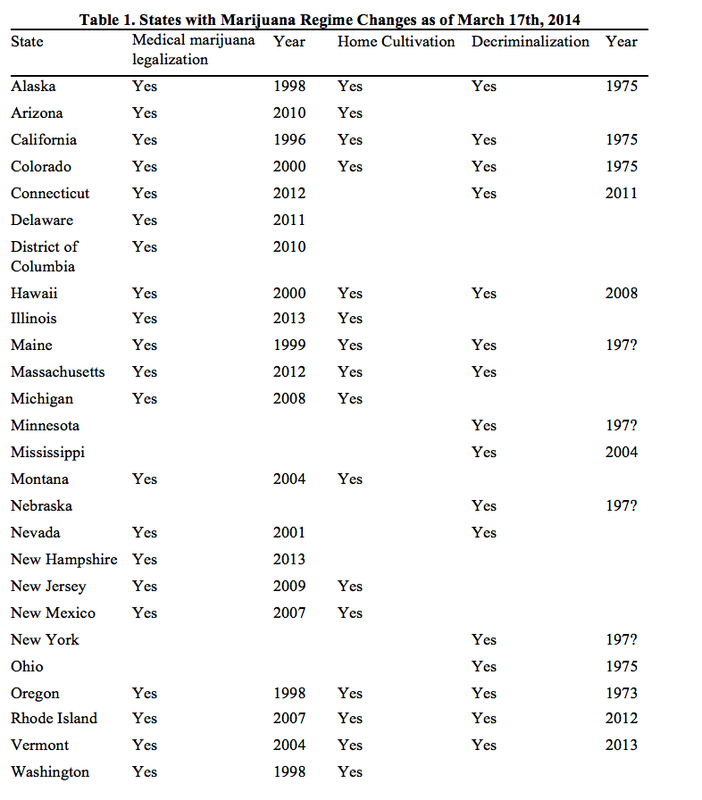 This time period fit well ~n it was recent enough to capture pre-legalization and post-legalization for 9 out of the 20 medical marijuana states (plus District of Columbia). Since the NSDUH covers all 50 states and District of Columbia, I had 9 treatment groups and 42 control groups in my difference-in-differences model. Finally, multiplying the number of years and the number of states gave me 561 observations of state marijuana use. The way the NSDUH measures marijuana use and for whom it measures marijuana use fit the purpose of my paper. I was interested in the number of marijuana users, and not the frequency or intensity of marijuana use among past users. The NSDUH provides state prevalence rates for first time marijuana use in the past year, which accurately measures marijuana initiates. It also provides prevalence rates for past month use, which I believe is an indicator of an occasional user. These prevalence rates are also broken down into four age groups: ages 12+ (the general population), 12-17(minors), 1825, and 26+. This allowed me to run regressions on different age groups, which could have implications for the exclusionary power of the medical card's age requirement, preferences across age groups, and the prevalence of legal-to-black market diversion. This age group breakdown was also valuable for the home cultivation variable, since that is another ageexclusionary law. Though the NSDUH fit my model, the survey data has some inherent aws. First, their state level estimates are derived from Bayesian hierarchical models and are associated with some uncertainty (Harper, 2012). Also, a single prevalence rate will be an estimate based on an average of data from two years. For example, NSDUH surveys are claimed to cover "2010-2011" rather than just 2010 or 2011. This made choosing which year to attribute to a give prevalence rate a personal decision, but ultimately the results were not sensitive to this decision. For independent variables, I simply coded the various marijuana policies as 1 or 0, and use government data on the controls for economic conditions. I coded medical marijuana legalization and home cultivation according to the legal status of each state as listed in Pacula, Powell, Heaton and Sevigny (2013). The listing was verified by legal scholars, and for the most part overlapped with information I found on http://medicalmarijuana.procon.org/. My criteria for decriminalization was the elimination of jail time for carrying up to .8 ounces of marijuana. For decriminalization I found news reports documenting decriminalization laws, as well as the website called NORML.org that linked me to state bills passing decriminalization. Anderson, D. Mark and Daniel I. Rees, 2014. "The Legalization of Recreational Marijuana: How Likely is the Worst Case Scenario?" Journal of Policy Analysis and Management, 33 221-232. Anderson, D. Mark and Daniel I. Rees, 2013. "The Role of Dispensaries: The Devil is in the Details". Journal of Policy Analysis and Management, 33 (2014) 235-240. Anderson, D. Mark and Daniel Rees and Benjamin Hansen, 2013. Medical Marijuana Laws and Teen Marijuana Use. Under Review. Harper S., Strumpf EC, and JS Kaufman (2012). "Do medical marijuana laws increase marijuana use? Replication study and extension". Annals of Epidemiology, 22, 207212. Miron, Jeffrey A., and Jeffrey Zwiebel. 1995. "The Economic Case against Drug Prohibition." Journal of Economic Perspectives, 9(4): 175-192. Pacula, Rosalie Liccardo & Beau Kilmer & Michael Grossman & Frank J. Chaloupka, 2007. "Risks and Prices: The Role of User Sanctions in Marijuana Markets," The B.E. Journal of Economic Analysis & Policy, Berkeley Electronic Press, vol. 10(1). Pacula, Rosalie Liccardo, David Powell, Paul Heaton, and Eric Sevigny. 2013. Assessing the Effects of Medical Marijuana Laws on Marijuana and Alcohol Use: The Devil is in the Details. Working Paper Series (May). (n.d.). Retrieved February 17, 2014, from www.NORML.org. (n.d.) Retrieved February 17, 2014, from http://medicalmarijuana.procon.org/. † Author: University of California, Santa Barbara, Department of Economics (anthonyduong@umail.ucsb.edu). Prepared for Economics 196A/B. I thank Professor Shelly Lundberg of UCSB for her expertise and guidance throughout the senior thesis process. I would also like to thank the Economics 196A-B class of 2014 for the helpful feedback for the last two school quarters. All errors are my own. Anderson, Rees, and Hansen (2013), 19-20. Anderson and Rees (2013), 4. Harper, Strumpf, and Kaufman (2012), 210-211. Anderson, Rees, and Hansen (2013), 17. Pacula, Powell, Heaton, and Sevigny (2013), 22. Pacula, Kilmer, Grossman, and Chaloupka (2007), 6. Pacula, Kilmer, Grossman, and Chaloupka (2007), 7. Pacula, Kilmer, Grossman, and Chaloupka (2007), 29.